American Idol determined the Top 10 contestants for Season 17 during Monday night's two-hour broadcast on ABC. 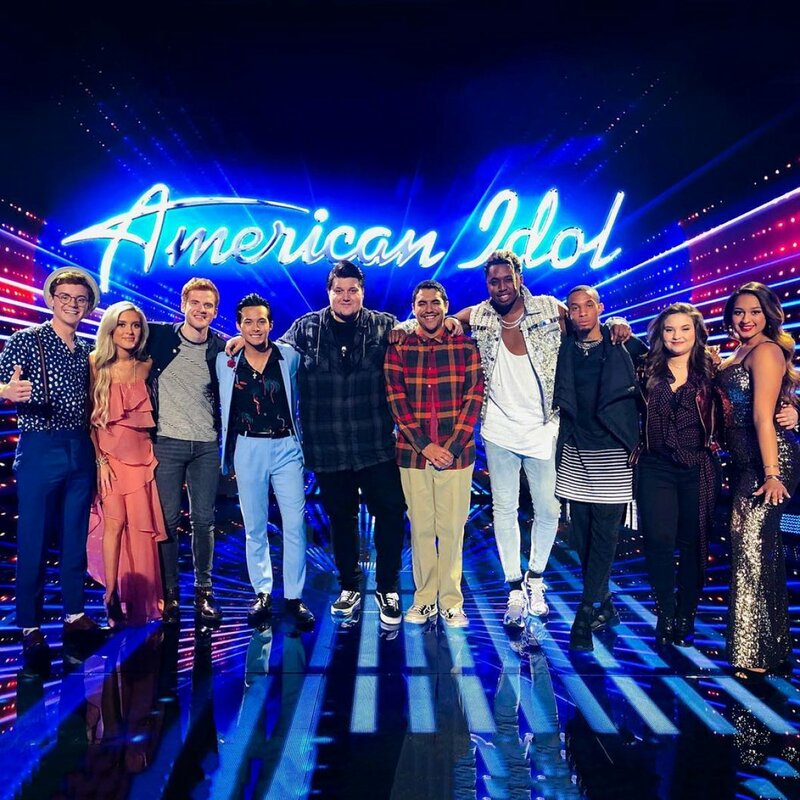 Seven of the singers automatically advanced to the Top 10 based on home viewer votes cast following Sunday night's Top 14 performance show. Those lucky seven contestants were Madison Vandenburg, a 17-year-old high school student from Cohoes, NY; Walker Burroughs, a 20-year-old college student and resident assistant from Birmingham, AL; Jeremiah Lloyd Haron, a 26-year-old music teacher from Catonsville, MD; Wade Cota, a 27-year-old musician from Phoenix, AZ; Laci Kaye Booth, a 23-year-old college student from Livingston, TX; Laine Hardy, an 18-year-old musician from Livingston, LA; and Alejandro Aranda, a 24-year-old dishwasher from Pomona, CA. In addition to receiving the good news, the artists got to sing again -- either a new song or a reprise of his or her favorite tune so far this season -- with no pressure on them. Madison took the stage with "You and I" by Lady Gaga, Walker sang "Lovebug" by Jonas Brothers, Jeremiah belted out an original song called "Almost Heaven," Wade performed "Simple Man" by Lynyrd Skynyrd, Laci Kaye sang "As Long As You Follow" by Fleetwood Mac, Laine sang "Hurricane" by The Band of Heathens, and Alejandro performed "Cholo Love." The other three artists who made the Top 10 were selected by American Idol's judges Katy Perry, Lionel Richie and Luke Bryan after singing a new song or an encore for survival. The three artists who fought their way into the Top 10 and ultimately earned a spot were Uche Ndubizu-Egwimis, a 24-year-old wedding singer from Sugar Land, TX; Dimitrius Graham, a 27-year-old retail associate from Baltimore, MD; and Alyssa Raghu, a 16-year-old high school student from Orlando, FL. Uche was Lionel's pick for the Top 10, Dimitrius was selected by Luke, and Alyssa was chosen by to continue in the competition by Katy. Uche decided to sing "Diamonds" by Rihanna for his survival song. Luke didn't understand how America couldn't feel the electricity Uche exudes onstage. Katy said Uche is a man of many different hats and he's learning the art of entertaining so well. Lionel then got up and out of his chair to give Uche a hug on the stage. Lionel told Uche that he is a performer who can touch lives, and with that being said, the judge walked Uche right over to one of the three available seats with the Top 10 contestants. Uche cried tears of joy and thanked Lionel for his support. "That is my pick!" Lionel yelled. Dimitrius performed "When the Party's Over" by Billie Eilish. Luke said he was emotionally connected to the song and was fighting hard for a spot in the Top 10. Katy insisted Dimitrius showed his heart, which is what he needed to do since he can sing basically every note on a scale. And Lionel explained the contestant showed more to himself but needs to believe in himself more. Luke advanced Dimitrius to the Top 10 because of the "sheer emotion" he felt from his performance. Luke admitted, however, he changed his mind about three times leading up to his announcement. And Alyssa took the stage with "The One That Got Away" by Katy Perry. Luke applauded Alyssa for coming back to American Idol this season with a vengeance as well as a shining light. He commended her commitment to music. Katy admitted Alyssa sang the song 100 times better than she could and that she's grown into a gorgeous young girl. Lionel also appreciated Alyssa's heart and her drive. "At 17, the sky is the limit for you. We love you," Lionel told Alyssa. When Katy selected Alyssa to advance on American Idol, she demanded the contestant fight for her life next time she sings. The rest of the Top 14 contestants got to sing for survival as well, but unfortunately, the judges decided they weren't quite ready to make the cut. The following contestants were therefore ousted from American Idol's seventeenth season: Evelyn Cormier, a 19-year-old teacher from Claremont, NH; Riley Thompson, a 16-year-old high school student from Mabank, TX; Eddie Island, a 25-year-old rideshare driver from Nashville, TN; and Ashley Hess, a 27-year-old dental hygienist from Fremont, CA. Evelyn sang "Dust In the Wind" by Kansas, hoping for a shot to stay in the Season 17 competition. Lionel said he was "in shock" to see Evelyn on the outs because he's a huge fan of hers. Katy said Evelyn is on her way to becoming a "spectacular artist" and Luke added America is probably trying to figure out her style and make sense of it but her talent is undeniable in her own lane. Riley performed "It Must Be Love" by Don Williams for her survival performance. Luke could tell her confidence was a bit shaken but he loved her song choice, saying it embodied what she had delivered thus far in the competition. Luke was surprised by America's voting results and Katy told her to brush this moment off her shoulders. Lionel told Riley she has a real shot to make it in the entertainment industry. Eddie took the stage with "Use Somebody" by Kings of Leon, hoping to land a spot in the Top 10. Luke noted the judges loved his personality but he's been a tad off vocally the past couple of notes, probably due to his potentially-wrong song choices. Katy admitted Eddie has some room for growth but that's okay, and she could tell he gets nervous onstage. "It's not that you're not good or gifted, it's that the competition is fierce... Celebrate, because you've come a long way," Lionel explained. And Ashley performed "Sir Duke" by Stevie Wonder, which really impressed all of the judges. Luke called Ashley "fearless" said she fought for her life and gave the most comfortable, natural performance without her piano. Katy said Ashley performed like she's got nothing to lose and it was the best performance by her the judge has ever seen. Lionel could tell Ashley was out of her comfort zone, which is "when life begins."